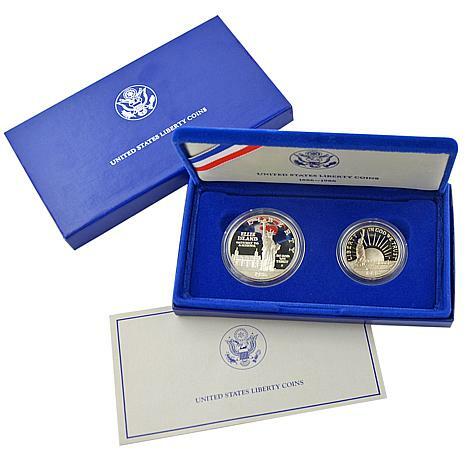 Celebrate Liberty's centennial with this handsome two-coin commemorative set. 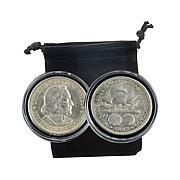 It features a commemorative silver dollar and companion clad half dollar commemorating the 100th birthday of New York's most famous landmark. These stunning coins come in their original government packaging. Obverse: Statue of Liberty with Ellis Island in the background; Inscriptions include "Liberty", "Ellis Island", "Gateway to America", "In God We Trust", and the date. Reverse: Liberty's torch; Inscriptions include "Give me your tired, your poor, your huddled masses yearning to breathe free", "E Pluribus Unum" and "One Dollar". Obverse: Statue of Liberty with rising sun in the background; Inscriptions include "Liberty", "In God We Trust" and the date "1986"
Reverse: Immigrant family arriving at Ellis Island; Inscriptions include "United States of America", "A Nation of Immigrants", "E Pluribus Unum", and the denomination "Half Dollar". 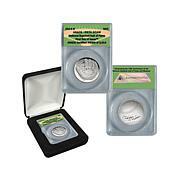 These coins are so beautiful, they stirred my heart when I opened the box!!! I thought of my grandparents going through Ellis Island. How lucky am I???? I am very pleased with the coin set. 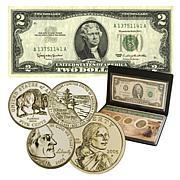 The coin set was in excellent shape. Very happy with the coin great gift. Very happy with the coins great gift.